Through Rosedale Piano Movers, we offer short and long term piano storage. Enjoy peace of mind knowing that your beloved instrument is resting safely in the company of other pianos. Our safe and climate controlled storage facility is regularly monitored by our staff. HST applies to all the above prices. 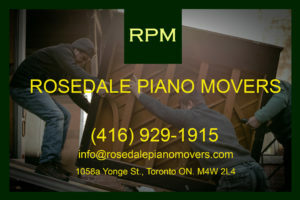 Call Rosedale Piano Movers for more information!